Fibercore, the UK-based developer of specialty optical fibres, will be officially releasing its new harsh environment graded-index pure silica core multimode fibre product at the Photonics West exhibition on 10-12 February. 3SAE Technologies, a provider of advanced fibre-optic preparation tools and glass processing equipment, announced today the expansion of its custom and standard fibre splicing and glass processing services and the addition of a new proprietary splicing service for soft-glass micro-fiber diameters ranging from 80µm to less than 25µm. Swiss cabling specialist R&M is putting a new generation of patch boxes for fiber optic networks on the market. With these platforms for 19" racks, you can terminate up to 48 fibers in one unit (1U). For the first time, a common basic model accommodates both breakout cabling and splice cabling. FibereasyRack 2 is the name of the version for breakout cabling. It contains a loose tube tray. The version for splice cabling is called UniRack 2 and contains a removable splice tray plate. CHESINGTON SOUTH, UK: Fujikura is introducing a new series of Fujikura fibre recoaters – the FSR-05, FSR-06 and FSR-07. The recoaters feature easy-to-exchange moulds for common coating sizes including 196 µm, 255 µm, 280 µm, 450 µm, 670 µm and 1,000 µm. All recoaters consist of a programmable resin injection quantity and colored and non-colored fibre recoating capability. The FSR-06 and FSR-07 recoaters include proof testers to test the strength of fibre after recoating. Fujikura has launched a new line of high precision large diameter fibre (LDF) cleavers designed for fusion splicing and glass processing preparation. 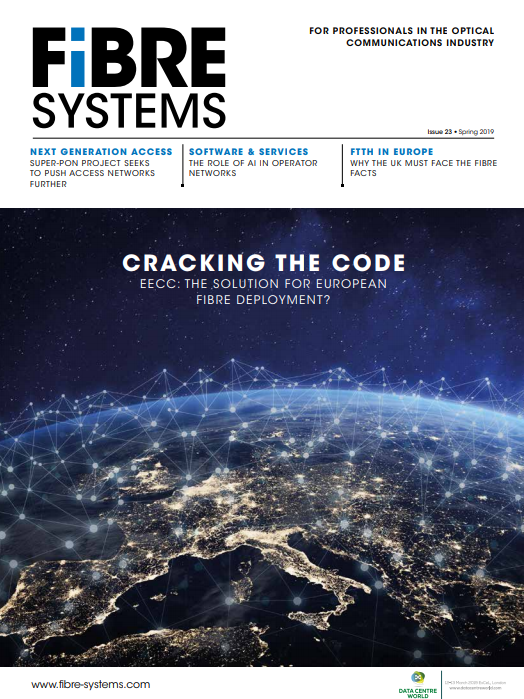 Fibercore, a UK-based provider of specialty optical fibre, has developed a new capability for the fabrication of multicore fibres. The standard product used for demonstration has four cores, but the fabrication method allows for virtually any practical configuration, spacing and number of cores. In the telecoms sector, multicore fibers can be used to reduce the amount of space required and increase the bandwidth of cables used in datacentres and exchanges. Molex has introduced FlexiBend MPO/MTP flexible-boot cable assemblies, designed to optimise cable routing and support low profile installations where cabinet doors or front panels might interfere with traditional straight style bend limiting boots. These optical cables can be used in datacom, telecommunications, medical, and industrial equipment cabinets and rack-to-rack applications, the company says. The assemblies feature flexible bend limiting boots which allow cable exits in varying positions from straight to a 90-degree angle.